A delicious South Indian pickle variety. Typically made during the summer months, the pickle stays good for a few months if stored properly. 1. Chop the mangoes into small pieces. 2. Add half of the salt and turmeric powder. 3. Mix well and keep aside for 24 hours. 4. Spread the mangoes on a large plate and keep it under the sun until fully dried. 5. Dissolve the jaggery in enough water and strain well. 6. 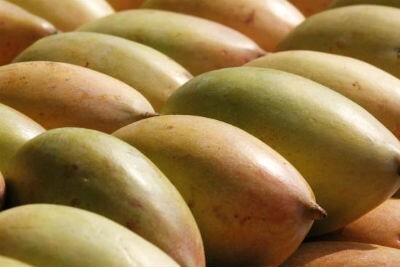 Add this to the mangoes and transfer to a large bowl. 7. Add the red chilli powder and mix well. 8. Heat gingelly oil in a pan over medium flame. 9. Fry the asafoetida and remove. 10. Drain well and grind to a fine powder. 11. Pour half of this oil over the mangoes. 12. Add the remaining salt, mustard powder, fenugreek powder and mix well. 13. Transfer this to a clear, sterilized jar. 14. 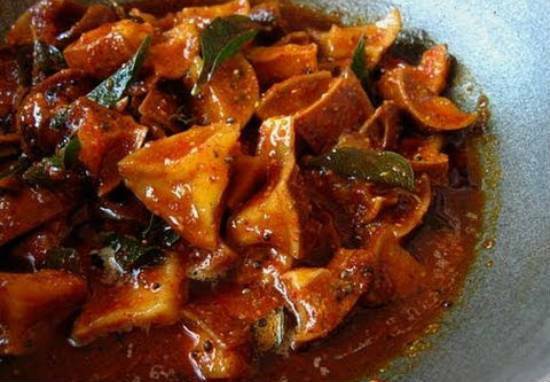 Fry the asafoetida powder and curry leaves in the remaining oil and pour into the jar. 15. Mix gently and cover it with a clean cloth. 16. Keep aside for a day or two. Note: Initially the pickle will be thin/watery, but over time it will become a regular pickle. Feel free to comment or share your thoughts on this Sweet Mango Pickle Recipe from Awesome Cuisine.